Dan Zettwoch and Kevin Huizenga are both St. Louis-based cartoonists in their mid-30s whose comics combine straightforward storytelling with strange interludes: some abstract, and some more like diagrams cribbed from an instruction manual. 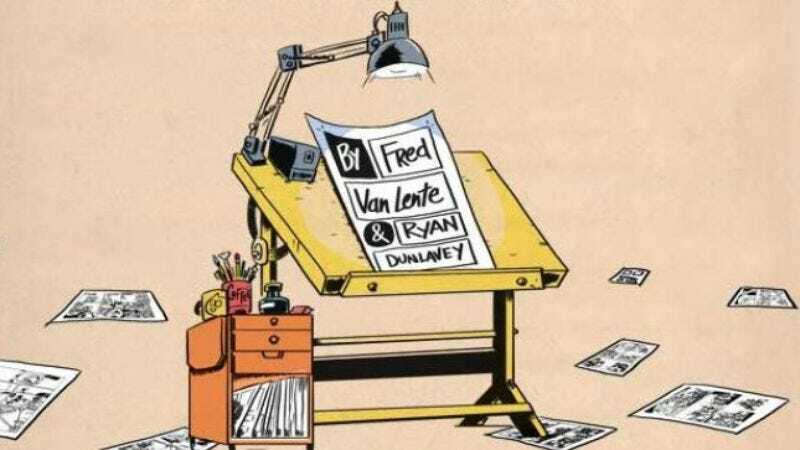 While the two men have some commonality in their approach—and both produce very good comics—the kinds of stories that they tell differ. Zettwoch’s new book Birdseye Bristoe (Drawn & Quarterly) concerns eccentric characters clustered in a colorful rural community, where the strange becomes normal; while Huizenga’s Gloriana (Drawn & Quarterly) is set in a more familiar suburbia, where the normal sometimes seems strange. Gloriana continues Huizenga’s “Adventures Of Glenn Ganges” series—or more accurately, it collects a few Ganges pieces previously published in mini-comics. In one of the longer stories, Glenn imagines becoming a father; in another, he encounters some neighbors who are spooked by a full, red moon, and he considers the scientific explanation for the phenomenon. As with all of Huizenga’s Ganges stories, the particulars of what’s actually happening to the hero matter less than what’s going through his head. Huizenga has a gift for depicting distraction: showing what it’s like to be kept awake by nagging worry, or to have difficulty completing a thought because other ideas keep elbowing in. The book culminates in a sequence of densely illustrated pages—connecting astrophysics to optical illusions—complete with charts, labels, and helpful arrows. It’s a powerful contrast to Glenn’s reveries earlier in Gloriana; the hero has difficulty describing how a sunset makes him feel, but he has no problem explaining why a moonrise looks the way it does. Birdseye Bristoe is also big on explanations, as Zettwoch breaks out schematics to show how his characters live. The book’s eponymous protagonist is an elderly landowner who spends a summer looking after his niece and nephew while trying to convince his neighbors to sign off on the giant cell-phone tower he wants to let a telecom company build on his property. Zettwoch begins at the end of his story and never completely circles back around, letting the reader fill in some of the gaps. But as with Huizenga, Zettwoch doesn’t seem to consider clear narratives to be his primary artistic goal. Birdseye Bristoe is more about Zettwoch’s detailed cross-sections of Uncle Birdseye’s home, where nearly everything is made out of bungee cord and empty 3-liter pop bottles; and it’s about the place the hero lives, which is one of those just-off-the-interstate nowheres that consists of a bait shop, an adult bookstore, and a few scattered farmhouses. There’s both love and awe in the way Zettwoch draws people surviving in a place with no name and no resources, beyond what some corporation chooses to dump at their doorsteps. Both Gloriana and Birdseye Bristoe feature a fold-out section: In the former, it’s an elaboration of what’s going through Glenn Ganges’ mind as he watches the sunset; in the latter, it’s an annotated drawing of the giant cell tower. In the context of their respective books, both foldouts depict human imagination: one as inward and inarticulate, the other as bold and foolhardy. But in the context of comics as a medium, it matters less what the foldouts say than that they’re there at all. They’re examples of Huizenga and Zettwoch unifying content and package, and considering new ways of presenting information. Even Huizenga’s introduction to Gloriana is clever, presenting Huizenga’s scrawled-out notes rather than an actual intro, as if acknowledging that some ideas are too unwieldy to be contained by mere words on a page. Shortly after cartoonist Richard Thompson launched Cul De Sac—easily the best new newspaper comic of the 21st century—he was diagnosed with Parkinson’s, which has led to a reduced production of new Cul De Sac strips over the past year. While Thompson’s been dealing with his health issues, his friend Chris Sparks has been pulling together the book/charity drive Team Cul De Sac: Cartoonists Draw The Line At Parkinson’s (Andrews McMeel), in support of The Michael J. Fox Foundation. An eclectic group of Thompson’s colleagues take a crack at Cul De Sac’s characters: the bossy preschooler Alice, her nervous older brother Petey, and the rest of the Otterloops’ friends, acquaintances, relations, and pets. Some of them—like Evan Dorkin, Patrick McDonnell, and Bill Watterson—do portraits. Others—like Stephan Pastis, Lincoln Peirce, and Ruben Bolling—do strips, incorporating the Cul De Sac world into their own comics and styles. Team Cul De Sac is a coffee-table book first and foremost, filled with terrific art, but it’s also a tribute to Thompson from his many admirers, who have noticed how in just a few short years, Cul De Sac has already become a classic, with a universe rich enough that 100 different artists can approach it and find something uniquely wonderful to highlight.